Computer Die Cut Oracal 6 Year Exterior Vinyl Sticker MADE IN THE USA. Material: Oracal 651 computer die cut vinyl. Has a 6 year outdoor durability. There is no background or outline in the decal, the background is whatever surface you place decal on. LED LIGHT BAR DECAL. LED LIGHTBAR DECAL. Can be any symbol on the keyboard. you would like on your led sticker. Step 7: Remove transfer sheet from the sticker by gently pulling at an angle from left to right away from the surface area that you placed the sticker, put one finger on sticker as you pull away transfer paper for best results. Computer Die Cut Oracal 6 Year Exterior Vinyl Sticker MADE IN THE USA. Press firmly in place and use a squeegee (credit card works too) to get all the air bubbles out. Peel off transfer tape making sure the entire sticker stays in place. 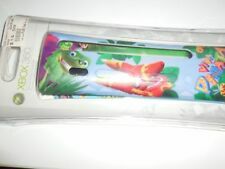 Decal including 4 pieces skin set ( Dock: front and back sides Console : back sides Joy-Con skin ). This skin decals Only fits NEW Machine Nintendo. Stylish & fashion design. Give your Switch that a stand out look. Features: *Highest Quality, Full Color, Anti-Slip Grip *Will not Scratch, Fade (UV Resistant) or Peel *Easy Install & Removal. Leaves Behind No Sticky Residue *Precision Cut for PlayStation 4 controller(Controller not included) *US Shipping. Expedited Service Available. This Sony PlayStation 4 Controller Skin is printed with super-high resolution graphics and ultra high gloss finish. It protects your devices from scratching, fading, and peeling. Our patented advanced air-release vinyl guarantees a perfect installation every time. Package Contains: -Sony PlayStation 4 Controller Skin. Stick Well. Cut down the glare when you are playing in the dark. Partially hide the blinding light. All just as shown on a white back sticker. This price is for 60 pcs. A great buy. Great gift for your friend and lovers. High Quality Indoor / Outdoor long life vinyl. BRAND NEW Faceplate for Original Nintendo Game Boy Micro GBM CUSTOM BOO! IT IS JUST FOR THE FACEPLATE. THE FACEPLATE IS THE SECOND PICTURE. THE FIRST PICTURE JUST HIGHLIGHTS WHAT YOUR SYSTEM WILL LOOK LIKE WHEN YOU ATTACH THE FACEPLATE. 100% GENUINEGAMEWRAPFREE SHIPPINGBEST PRICING100% GENUINEFREE SHIPPINGBEST PRICESDecorative Video Game Skin Vinyl Decal Cover for Nintendo 3DS XL /LLPAYMENTS & SHIPPING BUY NOW! RETURNS Don't like the bulkiness of a hard case, a silicon cover or a gel case? Now you can protect your Nintendo 3DS XL or Nintendo 3DS LL (Japanese Version) from surface scratch with GameWrap skin set. GameWrap Skin is NOT a hard plastic case, NOT a gel or silicone cover and NOT a screen protector. GameWrap Skin is a high quality decorative skin set designed to customize the look of your Nintendo 3DS XL. It does NOT protect your device from impact related damages. We accept VISA, MASTERCARD, DISCOVERCARD, AMERICAN EXPRESS and eCheck through Paypal. Carefully remove the translucent transfer tape from the decal at a 180 degree angle,making sure the vinyl decal adheres. Lay decal face down and on flat surface. Slowly remove backing paper from the translucent transfer tape at a 180 degree angle,make sure the decal is sticking to. 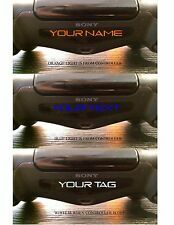 (Set of 2) PS4 Playstation Controller Lightbar Custom Decals - FREE Shipping! If you do not add which color, you will receive gloss black. You will NOT receive all 240 decals! If you would like a different design than what is listed. Made in the USA! All decals are ready to be installed. Stick Well. Cut down the glare when you are playing in the dark. Partially hide the blinding light. Thicker than normal stickers. Thick enough to block the light. Protect your light bar from scratching. NEW Nintendo Game Boy Color GBC Replacement Sticker Label USA! 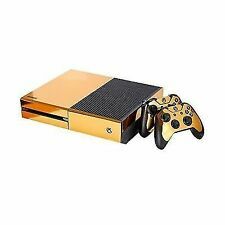 Microsoft Xbox One Console Skin Kit is printed with super-high resolution graphics and ultra high gloss finish. It protects your devices from scratching, fading, and peeling. Our patented advanced air-release vinyl guarantees a perfect installation every time. Package Contains - One(1) Microsoft Xbox One Console Skin - One(1) Microsoft Xbox One Kinect Skin - Two(2) Xbox One Controllers Skins. - Actual Console, Kinect and Controllers not included. Fits CUH-1001A, CUH-1115A, CUH-1215A Fast USA Shipping! XBOX - Retron 5 - Atari 2600 - Atari 5200 - Turbo Grafx 16 - Amiga CD 32 - PC Engine -AV 1 - AV2 - HDMI 1 - HDMI 2. Play Station - Play Station 2 - Play Station 3 - Play Station 4 - Sega Master System - Sega Genesis - Sega CD. TQS™ Sony PlayStation 3 Slim Console Skin Kit is printed with super-high resolution graphics and ultra high gloss finish. It protects your devices from scratching, fading, and peeling. Our patented advanced air-release vinyl guarantees a perfect installation every time. 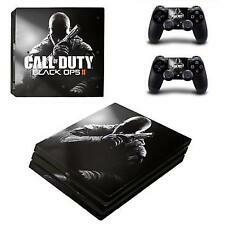 Package Contains: - One(1) Sony PlayStation 3 Slim Console Skin - Two(2) Dualshock 3 Controller Skins. 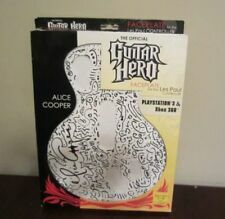 - Actual PlayStation and controllers not included. 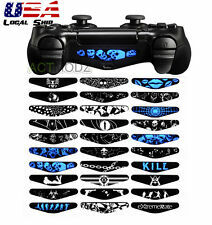 100% GENUINE GAME WRAP FREE SHIPPING BEST PRICING 100% GENUINE FREE SHIPPING BEST PRICES Decorative Video Game Skin Decal Cover for Sony PS4 Pro PAYMENTS & SHIPPING BUY NOW! RETURNS Protect your Sony PlayStation 4 Pro from scratches with this GameWrap high quality skin set. GameWrap Skin is designed to customize the look of your Sony PS4 Pro Console. It does NOT protect your device from impact related damages. We accept VISA, MASTERCARD, DISCOVERCARD, AMERICAN EXPRESS and eCheck through Paypal. Please pay as soon as possible after winning an auction, as that will allow us to post your item to you sooner! We offer FREE shipping and Tracking on all US Domestic orders! Your order will be dispatched within 1 working day of receiving payment (Monday-Friday). Orders with eCheck payments will be mailed out after payment is cleared. Kit for PlayStation 3 Slim is printed with super-high resolution graphics of advanced air-release vinyl material. It protects your devices from scratching, and fading. No matter you play Grand Theft Auto V, Grand Theft Auto IV, Minecraft, Disney infinity 3.0,Disney infinity 2.0, NBA 2K16, Call of Duty: Black Ops II, Call of Duty: Modern Warfare 3, Call of Duty: Ghosts, Batman: Arkham City, Batman: Arkham Asylum, Dark Souls, Dark Souls II, MLB The Show 16, Skylanders Super Chargers, Last of US, Red Dead Redemption or jailbroken, Arm of Two, this decal sticker will dramatically enhance your gaming experience. Description: . 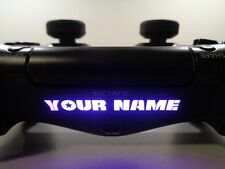 Fit right over your LED light bar to dim the light and illuminate an image of your choice on the front of your DualShock. (Cut using a precision cutting machine for a clean edge and perfect sizing. Designed with an easy peel backing for quick and easy application. We all make mistakes it happens to the best of us, so I got you covered :). Type: Silicone Cover Case. ---Material: Silicone. ---Soft silicone material,light,comfortable,durable and gives a good protection. Due to the different display and different light, the picture may not reflect the actual color of the item. 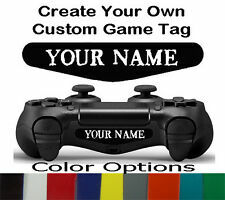 Set of 2 - Personalized Text PS4 Controller Lightbar Decals - FREE Shipping! 8 character limit. If you submit your text and do not add which color, you will receive gloss black. Made in the USA! All decals are ready to be installed. No "cutting" to fit. If you have the rights to images used and do not want them used in this manner. This skin decals Only fits NEW Machine Nintendo. 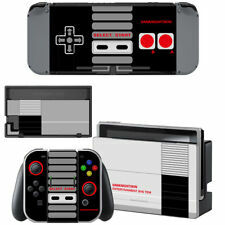 Decal including 4 pieces skin set ( Dock: front and back sides Console : back sides Joy-Con skin ). Stylish & fashion design. Give your Switch that a stand out look. 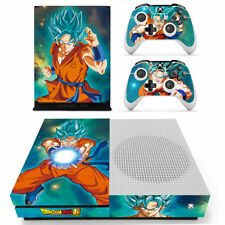 (1) xXBOX ONE S - Nike - Console Skin Set. Can be easily removed without leaving any residue. 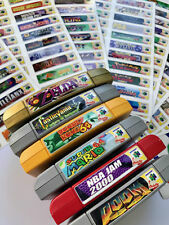 Simply peel away and reapply to a future console. High quality vinyl protective cover with adhesive back. These are high quality skin stickers. They are easy to apply and remove with no sticky residue. Stylish & fashion design. Material: Vinyl (not paper) ,easy to use and stick,easy to remove. No special skill required. 1x Nintendo Wii U Charging Dock WUP-014. Xbox 360 Slim Console Skin Kit is printed with super-high resolution graphics and ultra high gloss finish. It protects your device from scratching, fading, and peeling. Our patented advanced air-release vinyl guarantees a perfect installation every time. Install .